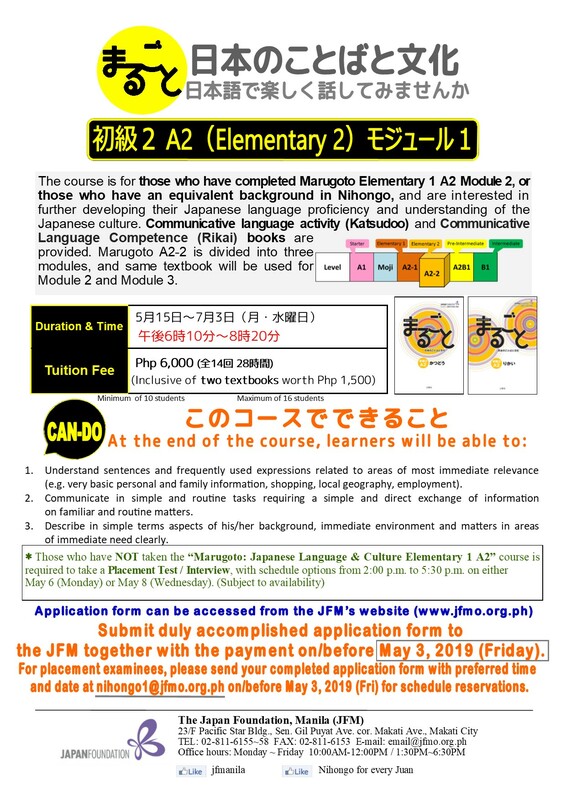 The course is for those who have completed Marugoto Elementary 1 A2 Module 2, or those who have an equivalent background in Nihongo, and are interested in further developing their Japanese language proficiency and understanding of the Japanese culture. Communicative language activity (Katsudoo) and Communicative Language Competence (Rikai) books are provided. 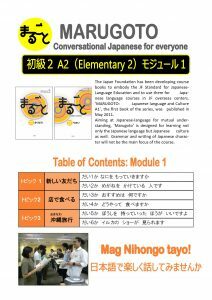 Marugoto A2-2 is divided into three modules, and same textbook will be used for Module 2 and Module 3. 1. Understand sentences and frequently used expressions related to areas of most immediate relevance (e.g. very basic personal and family information, shopping, local geography, employment). 2. Communicate in simple and routine tasks requiring a simple and direct exchange of information on familiar and routine matters. 3. Describe in simple terms aspects of his/her background, immediate environment and matters in areas of immediate need clearly. Submit duly accomplished application form to JFM together with the payment on/before May 3, 2019 (Friday). 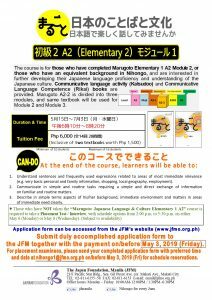 For placement examinees, please send your completed application form with preferred time and date at nihongo1@jfmo.org.ph on/before May 3, 2019 (Fri) for schedule reservations.